This wheel costs 100 NP to spin! You can spin this wheel once every 40 minutes. 1 A Grarrl roars at your Neopet (nothing happens). 2 You win 4,000 NP and an avatar! 4 You win 200 NP! 5 You lose a random item in your inventory to a tar pit. Note: With the inventory overhaul this appears to be glitched and you may not lose any item. 7 You win 2,000 NP! 8 A pterodactyl swoops down and bites your active pet, causing it to lose half its health. 9 A random Tyrannian furniture item. 10 You win 100 NP! 11 A random Tyrannian petpet. 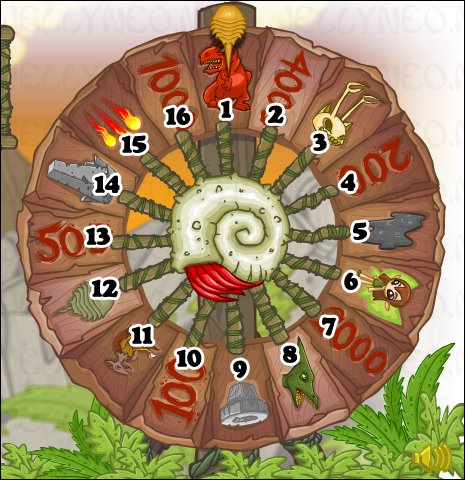 Note that you cannot win Krawk petpets from the Wheel of Mediocrity. 13 You win 500 NP! 14 You feel a strange desire to visit the obelisk... but nothing else happens. 16 You win 1,000 NP!